Many dog owners keep cleaners in their homes that are not exactly pet safe out of habit or ignorance of the bad effects they have on the household. 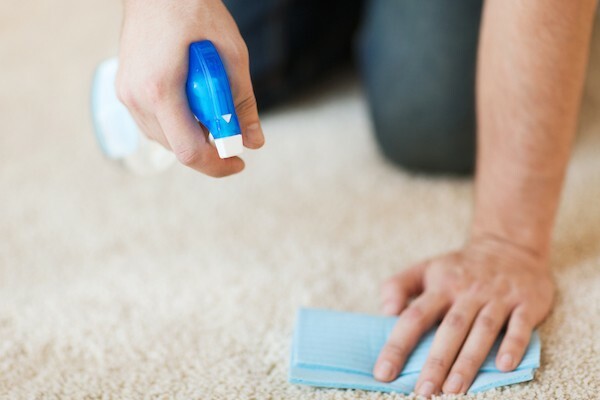 Cleaning products with ingredients such as bleach, ammonia, chlorine, gycol ethers or formaldehyde can cause many problems in adults and children, but young children and pets are particularly at risk for things such as cancer, anemia, liver and kidney damage. Many toxic cleaners are also carcinogenic. So, what are some household cleaning products that are not safe for dogs? Man cleaning carpet. Photography by Shutterstock.